Fall Class of 2018 and Class of 2019 members gain access to exclusive discounts at local Ithaca businesses as well as regularly occurring events throughout the entire year! "Theodore Zinck was a saloonkeeper in Ithaca, and his pub, the Hotel Brunswick, was a popular gathering place for Cornellians in the 1890s. After his death in 1903, several bars using his name (Zinck's) continued to provide a haven for students. 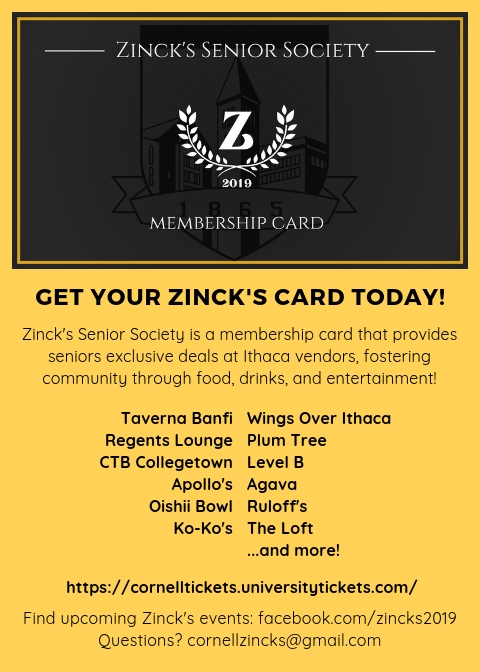 When the last Zinck's closed in the mid-1960s, celebrating the spirit of Zinck's became a favorite Thursday night Collegetown tradition for undergraduates. To this day, Cornell alumni around the world celebrate Zinck's night once a year." Once your purchase has been made, you will receive an email about card pickup. Any graduating senior (Undergrad Dec 2018, May 2019, Masters 2019) is eligible for Zinck's. Taverna Banfi - Free glass of house wine with any entree purchased. Regents Lounge - Sun-Tues (4-6pm) $2 off select drink and appetizers. Level B - Thurs, Fri, Sat $3 well drinks, domestic bottle beer and draft, well shots until 11pm; Tuesday Half Off for all regular priced drink all night long. Wings Over Ithaca - 5% off any order. Ko-Ko	10% off any order. Cash Only. Oishii Bowl	10% off any order. Cash Only. Plum Tree	8% off any order. Cash Only. Apollo's - 8% discount order from regular menu. U Tea - 10% off. Cash Only. The Loft - $4 house wine, $4 beer, $5 glass sangria, $12 craft sangria everyday. Once you purchase your card, more details will be sent on how to pick it up!